Home » Noisy Maltese surprise? Swits! Swifts are all over Malta, they differ a bit from seagulls. They can be very skilful and disturbing. They are chasing one each other all over the sky. You can spot them doing so almost whole season. You can spot them without any problems even in the streets of St. Julian’s or Sliema. Interesting think about swifts is about their origin. They came to Malta just few years ago and they are nesting especialy in urban areas. Ventilators or little space under the roof edge – that is where these birds come from. If you are real birdwatcher you can distinguish two to for different species of swits in the Maltese islands. The population of swifts is growing rapidly in last two years. Fighting them is very hard because they are great flyers and they spend most of their live in the air. They come down on surface only for breeding. 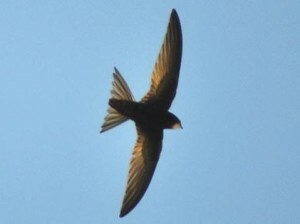 We will see how about swifts population in the future.